Another day, another Mammoth hunt. But the spoils of the hunt remain to be divided, and everyohe tries to secure the largest shares for themselves. Use tactics to gather meat, fur, tusks, and tools. Mammut is centered around a single mechanism: dividing the resources. It’s the core of the game. But to make it interesting, there are a lot of factors in the game which scores points, which makes some resources avaliable a lot more attractive than others. To score points in the game it’s all about having the most of or least of a token. If you have least, you’ll get negative points. If you have most, you’ll score. 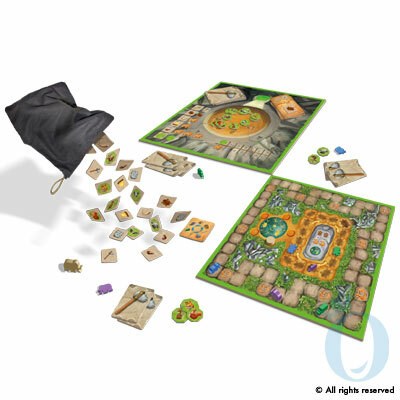 These items are all mingled together in a common resource pile at the start of the game. All tokens are two-sided with different resource on each side. Some are even question-marks – a hidden resource. At the start of the game, everything is in the center. The first player may choose as much as he wants from the pile, and whichever pieces he would like. He could take everything. But the round doesn’t end until everyone has a share. So the next player takes everything from you. But when stealing from other players, you need to put aside one resource of your choice, and place it back in the center. The next player may then choose to take whatever is in the center, or everything from you again, leaving yet another resource in the center. As the round progresses, the resources are divided more evenly. When everyone has a share, the game’s over. And the last player to draw, took the remaining in the center. Then it’s scoring time. Players have hidden cards which gives bonuses depending on the amount of resource you have. You may choose to play this card, and put it face-down in the center. When everyone has bid or not, the cards are turned over, as are the question-marks. Depending on the card you played, another play might win instead. The game teaches us a lot of how we share stuff. We can be greedy, selective, or very modest. It’s a great tool to learn younger children about sharing, but it’s also fun in an adult environment. 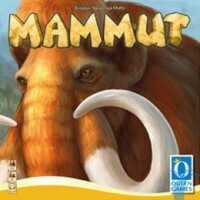 Add a Review for "Mammut"